Even in the heat of summer when winter feels very far away, it’s never too early to learn about apple tree winter care. You’ll want to take care of apples in winter to make sure you get crisp fruit the next growing season. Winter apple tree maintenance starts well before winter. In summer and fall, you can take actions that make apple winter protection easier. Read on for more information on apple tree winter care. Apple trees provide beauty all year, with frothy blossoms in spring, foliage and fruit in summer, culminating with mature apples in autumn. Apples in winter also have a serene, stark beauty. Proper winter care powers the entire, year-long cycle. Regardless of apple tree cold tolerance, your tree needs help getting ready to face the colder weather. Apples that get good care in summer and fall are already on the way toward appropriate winter protection. 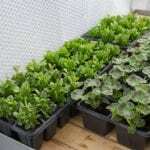 They will start the chilly season stronger and enter the next growing season in better shape. A critical first step is to make sure that the trees gets appropriate water and nutrients from summer through fall. Water stress weakens trees, while deep watering during the growing season creates long apple tree roots that are less susceptible to ice damage. 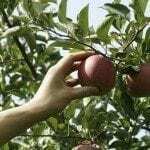 Fertilize your apple trees early in summer for stronger apples in winter. Avoid feeding trees in autumn, since the new growth produced is more easily damaged by winter cold. It also helps to clean up the orchard in autumn. Rake up and remove fallen leaves and fruit. Also, cut the grass beneath and between apple trees. High grass can house rodents as well as insect pests. You’ll also need to assist the trees during cold weather. Check your apple tree’s cold tolerance and compare it with your temperature. Ideally, you’ll do this before you plant the tree in your garden. A tree that isn’t hardy to your climate can’t stay outside in winter. Assuming the tree can survive a winter outside, there’s still winter maintenance to think about. Once the tree the bark freezes, paint the southern-facing side of the trunk with white latex paint. That prevents bark thawing on the sunny side of the tree, and the bark cracking that can follow. Other apple tree maintenance includes protecting the trunk from rodents. Wrap the trunk from the ground level up 3 feet (1 m.) with wire netting or plastic. Should you prune apples in winter? Don’t consider pruning in early winter since this increases the risk of winter injury. Instead, wait to prune apples in winter until at least February or March. Late, dormant season pruning is best. Prune out dead, damaged and diseased trees. Also, remove water sprouts and crossing branches. If the tree getting too tall, you can also lower the height by cutting tall branches back to lateral buds.